Great leaders aren’t born. They’re nurtured. – Eric Franklin. 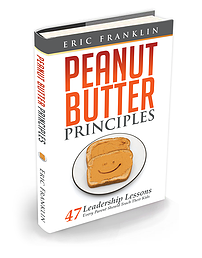 In “Peanut Butter Principles: 47 Leadership Lessons Every Parent Should Teach Their Kids”, entrepreneur, speaker, author, management consultant and parent Eric Franklin has assembled a wealth of wisdom that has stuck with him like peanut butter sticks to the roof of your mouth—gleaned from his parents, extended family, and the many other influential people in his life. One by one, readers can serve up spoonfuls of Peanut Butter Principles to the youth in their lives and make a profound impact to help them grow into confident, intelligent, and successful adults and leaders who make good choices, build healthy relationships, and cultivate another generation of leaders. I received a copy of this book and I really like that it teaches how to take responsibility for yourself. I think this alone is an important lesson for children to learn. This is an insightful and interesting book to read and I recommend for all parents! It really is a Must-Read! Peanut Butter Principles can be purchased on Amazon – http://amzn.to/1T9UeHD.